The peer corps team consisted of Dean of Nursing at Harding University Susan Kehl, Professor of Psychology at John Carroll University Elizabeth V. Swenson, Assistant Professor of Chemistry at West Liberty University Jon Serra, and Vice President of Academic Affairs at North Central University Don Tucker talk with Professor of Physics and Associate Dean Jeff Wilkerson after a forum. 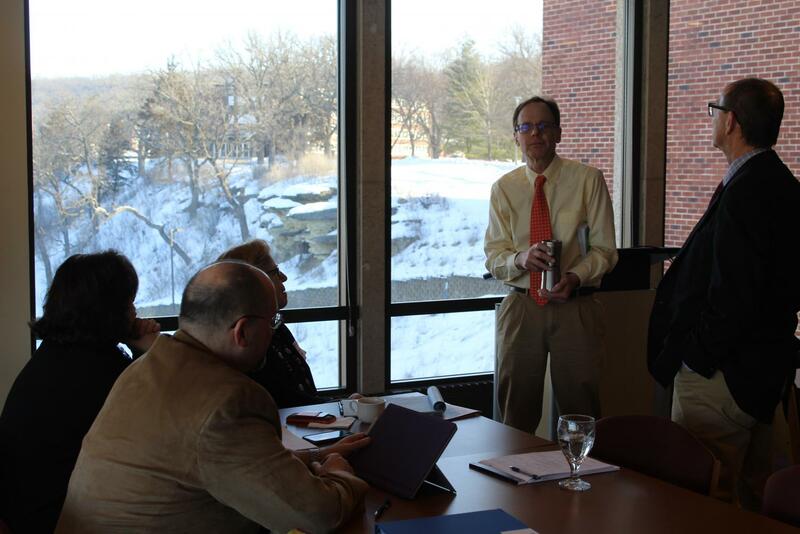 Representatives from the Higher Learning Commission made a visit to Luther to evaluate the college’s eligibility for re-accreditation March 11 and 12. Accreditation occurs every ten years, which, according to the Oxford English Dictionary is “official certification that a school, course, etc., has met standards established by external regulators; a professional endorsement or qualification of this kind.” Luther has been preparing for this latest visit since March 2018. During the commission’s stay, three forums were held in which faculty, students, and staff participated. According to Associate Professor of Religion Sean Burke, accreditation has important implications for Luther, making the process very valuable.